One of my spiritual teachers recently asked me to reflect on the “times you have missed the mark of your set intention. What was/are your reactions? Thoughts? Feelings? Responses?” This is good. It is just what I need to think about during this lunar cycle dedicated to the Capricorn desire for mastery and the possible shame that can rise up to challenge that desire. We are almost half-way through this lunar cycle*—the Moon is waxing into its Full phase at the end of the week—and we are at the end of January when we realize whether those New Year’s resolutions have any chance of succeeding. This is a good time to notice: What comes up for you when you miss the mark? The desire for mastery is held within a dynamic tension. On the one hand, we must see the places we need improvement in order to excel in our intentions. On the other hand, the force of shame, guilt, and inadequacy at not having yet reached that peak of excellence can undo our intentions to find mastery. From this tension these questions are relevant: How much do we benefit from comparing ourselves to others? How much do we comfort ourselves with the idea of “good enough?” What keeps us going in spite of missing the mark? What is the real goal? Is it accolade from others? The process of continuing on regardless of whether we fail or succeed? Why are we striving? How much is too much? How much is not enough? For me, this is where I want my thoughts to surrender to feelings. It is easier to feel where I want to be on the continuum between self-judgment and self-acceptance than it is to consciously know where the right place is. Capricorn’s mythical animal is the Seagoat. Last week I wrote about the goat part of the animal, which helps us climb our personal mountains step by step. This week, I want to invoke the fish tail that helps me remember that knowing comes from feeling, and effort does not always need to be against the current. Trusting my feelings to guide me in the work of mastery helps enormously in countering the messages of shame. I have another spiritual teacher who is always asking, “Do you dare to live in beauty, balance, and delight?” Answering, yes, doesn’t mean I’ve given up on self-assessment, but it does mean that the way I get there is perhaps more important than any particular peak I might reach. Dynamic tension plays a role in the Full Moon chart this week, providing a perfect opportunity to notice which side of the Seagoat is active for you. Is it possible to find the balance between? How do you recognize when you are there? Forecast January 20, 2013 – January 26. Sunday, January 20. By law, the Presidential Inauguration must take place on January 20th, but since this year the 20th is a Sunday, the public inauguration will happen tomorrow. However, the official inauguration still happens today in a private ceremony. Notably the Moon today is square to Mars. Does this portend a second Obama administration marked by outright conflict? That seems like an easy prediction. Finding common ground with those who seem to hold vastly different values from our own is a theme for today. Pluto enters the second decanate of Capricorn also. Astrologers divide each sign into three equal segments. Pluto at 10 degrees Capricorn signals another push into new territory for transformation. When Pluto entered Capricorn, the economic systems of the world collapsed due to many corrupt factors. We have not really solved the problems that caused this collapse. It isn’t recommended to maintain denial under a Pluto transit. As we go forward, expect to be challenged to go deeper. Monday, January 21. Martin Luther King Day and the public inauguration of President Obama are today. 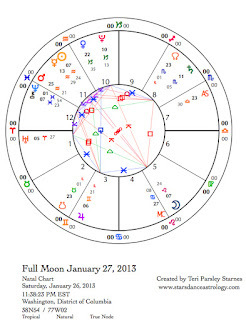 When Obama takes the oath today, the transiting Moon in Gemini will be conjunct (same place as) his natal Moon. This is a powerful position; he should be feeling pretty good even if public support for him most likely will not match the one he received at his first inauguration. Neptune is square the Moon today and square to the President’s natal Moon as well. This transit from Neptune to his Moon offers the opportunity for immense heart expansion through a testing of faith. Obama is a man and he is a symbol for the nation. This means that we get to invoke, pray, visualize (however you like to work) that this heart opening happens for the nation too. This moment of inauguration is a powerful one to use for the manifestation of our highest ideals. “The moon will pair up with Jupiter on the night of January 21, in what will be the closest moon-Jupiter conjunction until the year 2026.” [http://earthsky.org/tonight/moon-in-front-of-aries-the-ram-on-january-19] Mental energy is high today and there could be large swings in mood. Let the beauty of the Moon and Jupiter inspire you to rise up from the small things to align with the big picture. January 22—Gibbous Moon: Perfecting. That word, “perfecting” triggers shadow emotions around mastery. Often this phase of the Moon is the best place to notice all those impossible expectations we hold for ourselves and see if they are helping or hurting the manifestation of intention. However, today we are bolstered by a feeling of the strong wind in our sails. Mercury is contacting in favorable ways both Uranus, ally of authenticity, and Jupiter, ally of opportunity. Sometimes the fear of success is even more uncomfortable than the fear of missing the mark. This is another continuum to hold in dynamic tension: Which are you most afraid of? What helps you work through that feeling? Wednesday, January 23. Gemini Moon energy can be tricky. The dual nature of this sign can easily make us feel like we are ping-ponging between extremes. Mindfulness practices can really help. Until this evening when the Moon enters Cancer, most of the day is a void-of-course day where we may be disturbed by a lack of focus, energy or momentum. Notice how you feel about that. The ability to relax the mind is a wonderful skill to master. Tonight, home and hearth call to us. Time to recharge our batteries. Thursday, January 24. It would be nice if the Cancer Moon today would just be about some good home cooking, but I’m afraid it won’t be that easy. The perfecting pressure of the waxing Moon might boil over today. How do you cope with tension? The root cause of tension will be our emotions. Cancer is the complement to Capricorn. If we are perfecting a sense of mastery without shame, the emotional tone today and tomorrow will show us some of the habits we have around taking and projecting blame. Our hearths can nurture more than our bodies, how will you nurture your intentions? The day ends with an energizing relationship between the Sun and Uranus sparking our desire to create change. Friday, January 25. Some days the split between our emotions and our thoughts are the source of misunderstandings and confusion. Today we may have our wires crossed with others or even within our own complex inner domains when we fail to pick up on important cues. Back up and get clarity. The square between Mercury and Saturn is saying just that. We may misunderstand, but we can go back for more information or to share what we are feeling. Like yesterday, today ends on an upbeat, however. The Sun in visionary Aquarius and Jupiter in curious Gemini pair up for endlessly fascinating conversations. We are all brilliant! It may be hard to calm the mind to get some rest. 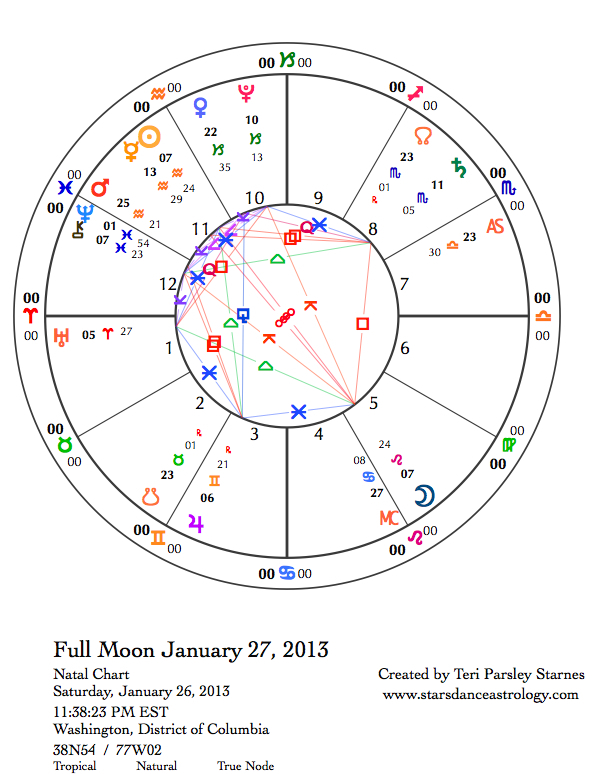 January 26—Full Moon: Illuminating. This Full Moon tells a story of the relationship between the opposing signs of Aquarius and Leo. Full Moons are illuminating, not just because they are the brightest visually, but also because they illuminate how pairs of opposite signs make a whole. What we think of as contradictory desires are actually two pieces of the same thing seeking wholeness. These two signs give us an appreciation for the wisdom of the collective and the brilliance of the individual. It is easy to value one over the other. Western culture has glorified the rugged individual for a long time. Yet, in spite of that, a strong puritanical element in our culture also instructs individuals to deny their own significance. We aren’t comfortable with pride or knowing our impact. These stories play into our attitudes about mastery and shame. We have an opportunity to see how going it alone or disappearing into the group are both dead-ends. Saturn, the Master of mastery, is square to both the Sun and Moon. This planet likes to get us in his cross hairs and keep the pressure on until we break through to knowing our true gifts and true skills. Questions about mastery—such as what do I want to be known for, who am I serving when I reach for mastery, how do I know and accept responsibility for my impact, what vision guides my journey—yield good insight. The more honest we are with ourselves, the more authority we gain. We feel Jupiter’s influence strongly too. Although in the tropical system of astrology, Jupiter has been transiting through Gemini, visually we’ve seen this bright and beautiful planet amongst the stars of Taurus, holding steady in the center of that constellation near the Eye of the Bull since early December. Jupiter has slowed down and is getting ready to turn direct next week. It will remain in this area of the sky till the end of March. The Eye of the Bull star is also called Aldebaran. According to Bernadette Brady’s book, Brady’s Book of Fixed Stars, this royal star is linked with the pursuit of integrity and honesty. Jupiter gives us the confidence to stand for our truths and to honestly assess ourselves. We also want this from others and see the value of honest integrity in those we admire. Take a moment to glimpse Jupiter in the night sky. It is visible from sunset to dawn.